If we look, we can see him. His love. His touch. Everywhere. Savannah Grace Colopy turned two weeks old yesterday. Oh friends, what a month this has been! We’ve been bursting to tell you about it, but we wanted to wait until some final papers were signed. 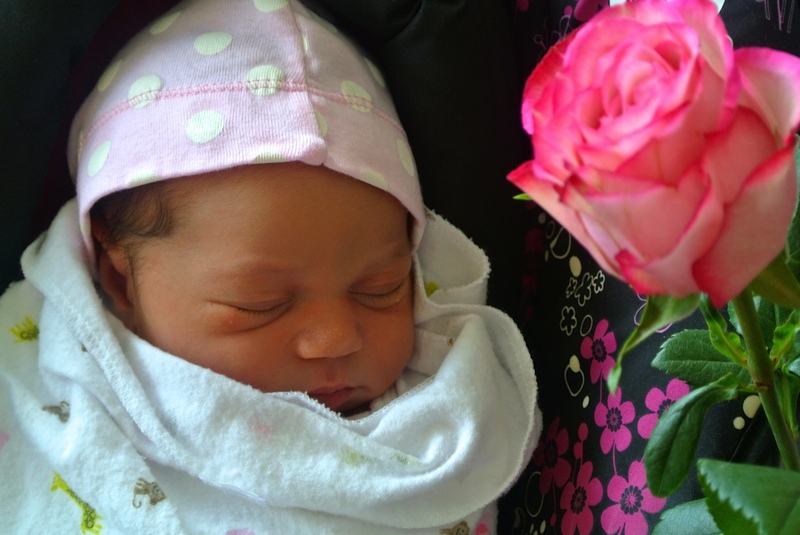 But now… now we can tell you the story of Savannah Grace and how she came into our world. It all started with a text. It was my mom. She lives in Florida and when I called she told me of an e-mail that someone had sent to her church’s office. A young pregnant woman was looking for parents for her baby – did they know of anyone who might be interested? The secretary at the church knew our story and sent the information to my mom. My mom called on Thursday afternoon, February 7th. The baby was due Tuesday, February 12th – only five days later. In Orlando. Hmmm. What are the odds? I was already scheduled to fly into Orlando for a speaking engagement. On her due date. On the 12th. I talked to Brian. We stared at one another. Grinned a goofy grin. Could it be? I called the number my mom had given me. I thought I was going to talk with a friend of the birth mom, but instead I ended up with the birth mom herself. We’ll call her Jordynn. I wasn’t expecting to talk to her directly and was less than eloquent. I felt like I stumbled all over myself as I shared some of our journey, about our boys in Haiti, about our lives. I asked about her world and she was articulate, kind and gracious. She wanted the best for her child and didn’t have the means to care for or provide for her. She wanted to know more about us, so I referred her to our adoption blog to see our pictures and read our story, and then encouraged her to Google my name to find out more about us. I figured it would take a very special young woman to look at our world, our adoption of two active boys from Haiti, our wrinkles, our wacky sense of humor – and find it appealing to place her daughter in our care. Then I Googled my name to see what came up first and what she might think. It was my book: Pure Love, Pure Life – the purity book for teens. Great, I imagined her thinking. She’s one of those people. We waited several more hours and then Jordynn called us back. “I would be honored and delighted if you and Brian would raise my daughter,” she said. I nearly fell over. Brian’s jaw dropped. Really, God? Would it happen like this?? Oh friends, the next weeks would bring tremendous highs and gut-wrenching lows. Over the next few days I’ll share the story on our adoption blog (www.WhenHopeComesHome.com – you can sign up to receive it via e-mail by clicking on the link if you like…) – but for now, will you celebrate with us? Savannah Grace Colopy is now in our world. Daughter to Brian and Elsa, Little sister to Sean, Jessica, Cassie, Sam, Lovence and Laurentz. We are a family of seven and we couldn’t be happier. A Life in 50 Words.